Chaperones and teachers are responsible for student behavior and discipline. Please remove any student(s) causing disruption. In addition to teachers, we strongly recommend one chaperone for every 10 students (these adults are admitted free of charge; additional adults must pay the group admission fee of $6.00). Chaperones and teachers must stay with their group at all times. Chaperones and teachers are responsible for keeping their group together. For this reason, we ask that you do not wander off to look at exhibits on your own. When this happens, you are no longer an asset to the students. You are welcome (and encouraged) to come back another time to tour the museum on your own. Chaperones and teachers are responsible for escorting students to and from the restroom when necessary. Chaperones and teachers are asked to immediately follow any instructions given by museum staff, volunteers or security personnel. We ask that you do not bring younger children with you as they require your full attention and are a distraction to the students, volunteers and you. 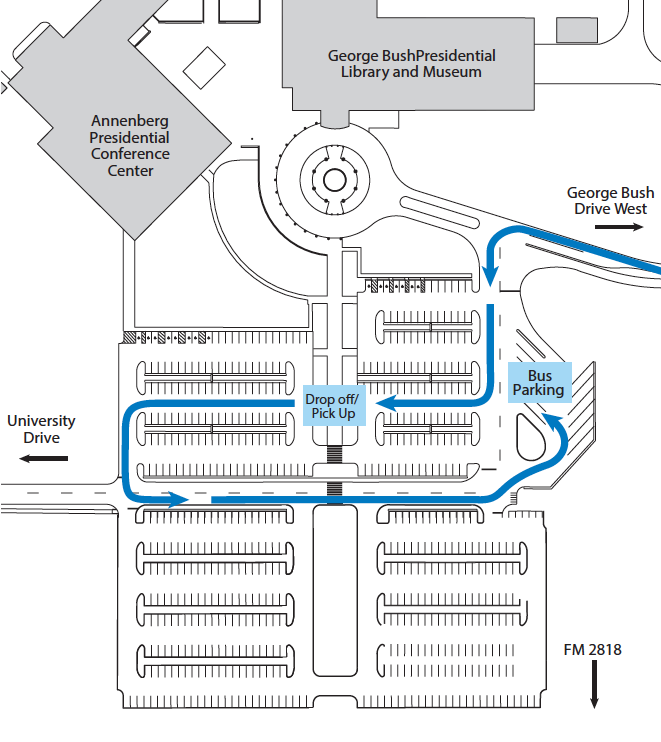 School buses dropping off students to visit the Bush Library and Museum should proceed through the parking lot and enter the third parking row. Buses can unload at the crosswalk, then continue through the parking lot and circle back to the “bus parking” area. The same procedure will be used in picking up students. Please see the diagram below. School buses are not allowed to drop off or pick up students in the circle drive in front of the museum. For more information or to make a reservation, please email bush.education@nara.gov or call (979) 691-4006. If I can be of further assistance, my email is shirley.hammond@nara.gov, or I can be reached by phone at (979) 691-4013. It is our hope that your visit will be an especially memorable educational experience, and that your students’ understanding of American history will be expanded during your visit.